oh, how sweet. Makes the mind turn to all the salads they'll be delicious in (or just by themselves with a little salt yum!). 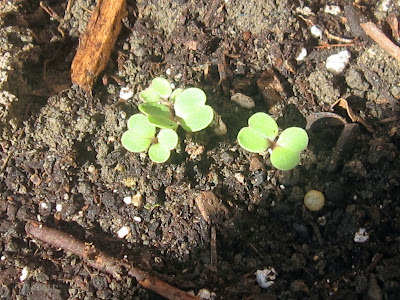 We have little seedlings here too. I can't wait for the summer to see how our garden grows this year. Have you ever tried a radish sandwich? I got a comment recently about someone's grandmother who used to make sandwiches with radishes, butter, and a little salt. Something to try this year! Hah, we must have both been outside marveling at the same time! I came out this morning and saw radishes peeking up and just about had a dance party in all the mud (4 days of continuous rain, day off, then 2 more day of rain). Sure sign that spring is just about here! I can't wait!! Christy-- dance parties in the mud are the best. Stephanie-- my husband said the same darn thing! They sure do, don't they? They DO look like 4-leaf clovers! Thanks. It's a small start, but soon everything will be on its way. These make me smile! LOOK how they look like lucky clovers, too! Thanks for this great pic. thank you for reminding me...............radishes taste best in the spring too. I am eagerly awaiting arugula, spinach, peas and greens, but they will take closer to 6 weeks. My arugala is up now, too! Having a cold frame has been a real boon this spring.